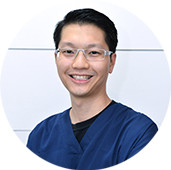 Dato’ Dr Raymond brings to the clinic an abundance of experience and expertise from the years of additional postgraduate training and daily clinical practice on a wide range of cases. To date, he has been with Chai Dental clinics for 18 years after his return from Ireland in 2001. This has gained him a wide following and continuity. He has had the privilege of treating families from one generation to another. Dr Raymond values patient relationships. It is his priority to deliver the gentle and compassionate care that you deserve. He works hard to make you feel at ease by providing exceptional patient care in a relaxed, state of the art atmosphere. To provide a high level of patient care, he continues to update and upgrade knowledge regularly, averaging 200 hours of continuing professional education per annum. He was awarded in January 2017 the masters degree MClinDent in Prosthodontics by the prestigious King’s College London(KCL) on completion of a four year study. Dr Raymond is well-known for managing highly anxious patients with dental phobia and is a able to combine a gentle chairside skills, laughing gas, sedation and various other techniques due to his past surgical training in UK hospitals. He welcomes referrals from colleagues for complex cases. Dr Raymond is the founder of Synergy Dental Specialist Clinic. Trainer & facilitator for workshops with Malaysian Dental Association and in Dubai during the Asian Pacific Dental Congress (APDC), training dentists in facial aesthetics. Former council member of Malaysian Dental Association for four terms, and Chairman of subcommittees. Chairman of 19th MDA/FDI Scientific Convention and Trade Exhibition. Member of Committee of Guidelines & Provisions for Public Information, of Malaysian Dental Council (2012 – current). Past speaker and journal contributor for the Malaysian Oral Implant Association.